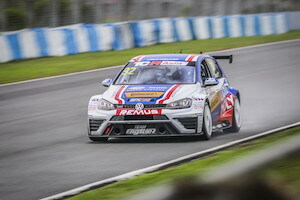 It was another solid points collecting spree for Liqui Moly Team Engstler at the Zhuhai International Circuit after Rounds 3 and 4 of the TCR Asia Series to maintain the lead in both Team and Driver Championships. Diego Moran’s weekend started out well until a small mistake during the first Qualifying session meant he had to fight to recover from it throughout the weekend. He started both races in tenth and could not reach the podium both times but his steady points collection has kept him in first on the leaderboard with 72 points. Teammate Kantadhee Kusiri fought hard the whole weekend against some very experienced drivers who consider Zhuhai their ‘home’ and he performed well to claim a podium finish in Round 3. Kusiri is just 4 points behind Moran and the teammates will work together to make sure that they keep the steady points collection going for Liqui Moly Team Engstler. Both Kusiri and Moran showed their speed in the Volkswagen Golf GTi TCR around the Zhuhai Circuit, another new circuit for the duo. Kusiri started Round 3 in fourth and was up to second right at the opening lap, giving the lead Audi a tough fight throughout the race. The two exchanged positions a few times but Jasper Thong was just that slight tenth faster to maintain his lead to the finish line. Meanhile Moran who started in tenth was immediately on pace and began to pick his way through the grid throughout the race, finishing just off the podium in fourth. 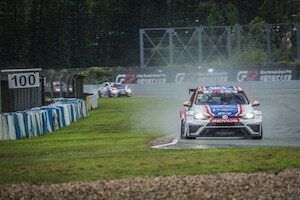 Rain brought on another set of challenges for the Liqui Moly Team Engstler late Sunday for Round 4. Both Kusiri and Moran had to fight hard for positions against the impressive bunch of Audis but they never gave up. Kusiri who started the race in fifth fought against the weather and almost gained positions at the start but could not manage it against the more experienced drivers. He finished fourth. 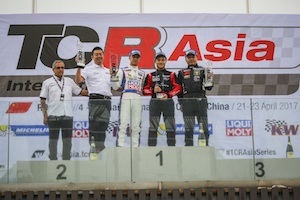 Kusiri said after the race, “I'm happy with these two races that we had at the Zhuhai Circuit. The first race was good but unfortunately, the result for the second race was not so great. I pushed as hard as I could so I have to be satisfied with that. We will be back soon and will try again”. Moran did not manage to improve his positions much from tenth, finishing the race in eighth and collecting points for the team. “A very tough weekend for me because I could not find the consistency to be on top. We managed to stay out of trouble to bring the car to the finish line without a scratch, which was very important considering the conditions and how hard all the drivers were fighting. We managed a good points collection for the Championship and it is good to know we stay on top! I am confident of what we have learnt this weekend and we will fight back at the next round where I am sure we will be stronger. Thank you to the team for a great job as always” ended Moran. Sport & Marketing Director for Liqui Moly Team Engstler, Kurt Treml was happy that the drivers and the team could see that their hard work is paying off. He was also happy that the team managed to keep 280 Liqui Moly China guests entertained with two great races. “It was a hard race as we have expected but we managed to reach our target and to leave Zhuhai this weekend in the Championship lead! Our drivers did not take unnecessary risks, saved their positions and fought well throughout the weekend. It was their first time here in Zhuhai and not having track knowledge was hard, especially with the rain. Anyway, we will be back in 3 weeks and we will fight again. “I am proud in the whole team, we finished both races without any technical problem and defend our position in the Championship, plus the 280 guests from Liqui Moly had a wonderful time watching two fantastic races and they all left with a smile” ended Treml. Liqui Moly Team Engstler will return with TCR Asia Series to Zhuhai International Circuit for another two rounds on 12-14 May 2017.